We were planning on having this for dessert over the Christmas holiday weekend, but when it came time to eat Christmas dinner, we realized we had vast amounts of desserts, cookies, and other goodies that could surely last us well into the new year. Plus, with one less mouth to feed (rest in peace, Mom) the food would most likely be devoured even more slowly than in years past. So, after putting a dent in all of our more perishable holiday treats, we finally got to this delicious pudding Monday night as a sort of midnight snack after our regular bi-weekly podcast recording. And since it was late, neither Sonia nor I wanted to consume many calories before bedtime, but man, we really had to exercise some willpower not to eat the whole thing. The readied product looks like it just emerged from a fancy jello mold, although we failed to snap a picture at that particular juncture, and instead captured what the product will look like after being divvied up among many hungry holiday guests. It's like a delicious bread pudding, but full of yummy dates and covered in this amazing liquid toffee syrup. 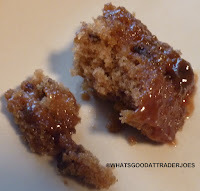 Just imagine a Heath bar, sans the chocolate, but melted into this perfectly smooth, sticky, butterscotch-esque topping. It's absolutely divine. At around $4 a box, it's not too pricey. It supposedly serves two, although with the amount of fat and calories it packs, you might want to spread it around to the whole family. The packaging specifies microwave preparation in just a couple minutes. I think it might be a seasonal item, but I'm not sure. If so, well...then most of you folks will probably have to wait until next year to pick it up. But Sonia and I are here to tell you it's definitely worth it. You've heard all that fuss about "figgy pudding" in that Christmas carol. Well, bring us some more datey pudding, and bring some right here. One of the Magic Kingdom restaurants offers this as a dessert but even with wanting to try it for years I never end up wanting dessert when I'm there. When I saw it at TJ's I had to try it to see if I had been jonesing over something I would hate. Nope TJ's version is amazing. It takes a whole 90 seconds to make and is worth every one of it's outrageous calories. Make my kids all take just one bite, which they did with crinkled, I'm not gonna like this noses and they all went back for more. I hope it's not just seasonal. Yep. Very tasty. I'm sure most kids would love it like you said. I hope it's not just seasonal, too! It's a holiday dessert in canada (I'm thinking cause of our British ties). This one is even made in Canada. I usually make ours but will give this a try. Love TJs exposing the US market to foreign products. But have u had a butter tart or Nanaimo bar?!?! No, but I just looked them both up and now I want some. In the freezer by the ice creams. It Migh just be a holiday item. While it says it's supposed to serve 2, we served it with English custard and served 3 adults and 2 children with it. Perfectly delicious. A bigger portion would have put us in a food coma. I had one for the first time while in Niagara Falls, Ontario. 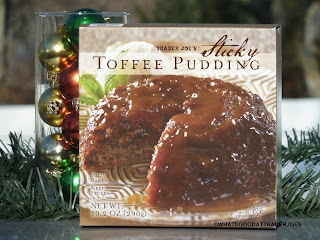 I cannot wait to try the one from Trader Joe's! Trader Joe’s told me they have discontinued this and I’m heartbroken because it was a family favorite!!! Oh no!! We love this!